Thrill-seekers are invited to raise two fingers (or "scissors") at the UK finals of "Rock, Paper, Scissors" in London tonight (23 November) - the problem being your opponent may make a bunched fist, or "rock", thus blunting your attack. Of course you could pre-empt the rock by holding out a flat palm, to signify "paper" - except that this tactic is equally fraught with danger as your opponent may employ the scissors manoeuvre himself, cutting you to ribbons. Long seen as a simple children's pastime, or a way to decide who gets in the next round. rock, paper, scissors - or "RPS", to its many devotees - is increasingly being used as a way to meet friends, motivate staff and even make money. At the championships at the Green Man pub in near the Bank of England in central London, 32 contestants will pay £13 each to battle it out in a knock-out tournament. The last two standing will compete for a bottle of champagne plus the proceeds. Surprise your opponent - if you're big, scary and muscular, throw paper. Wear fancy dress to confuse your opponent - i.e. a scissors themed fancy dress and throw paper. Wear sunglasses - to prevent your opponent from studying your eyes. Try reverse psychology - tell them what you are going to throw and let them figure out if you will. Scissors is statistically the least thrown - therefore paper is statistically the safest throw. Rock, paper, scissors has been around for centuries. In his book Wuzazu (circa 1600), Xie Zhaozhi claimed the game was first played in the time of the Han dynasty (206 BC-220 AD). Known in China as "shoushiling" and in Japan as "sansukumi-ken", the game has even been used to make big decisions down the centuries. When Japanese tycoon Takashi Hashiyama decided to sell a collection of paintings by Picasso, Cezanne and Van Gogh in 2005, he asked auctioneers from Christie's and Sotheby's to participate in a game of RPS to decide who would handle the sale. Christie's won - and made millions from the auction. 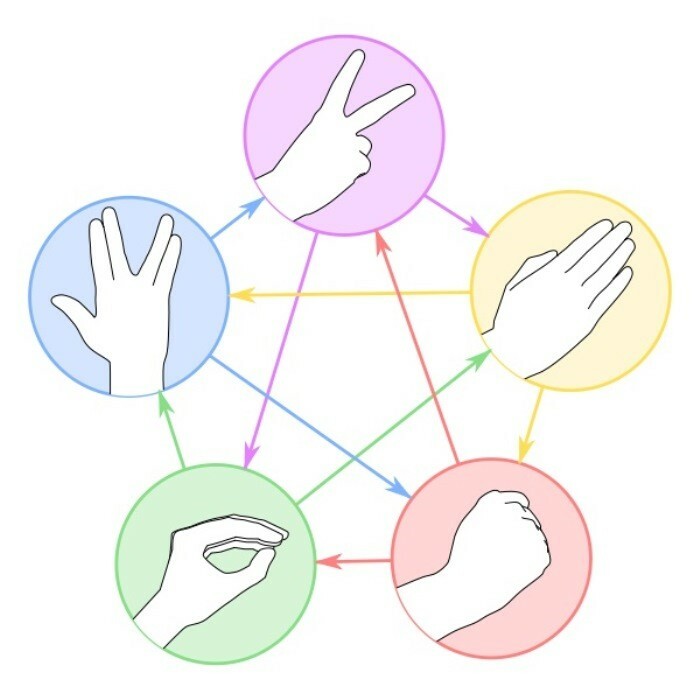 Controversially, in recent years the game has been developed to include two extra elements, giving it the moniker "Rock Paper Scissors Lizard Spock". Invented by Sam Kass with Karen Bryla to reduce the chances of a draw, RPSLS is seen being played on US sitcom The Big Bang Theory.